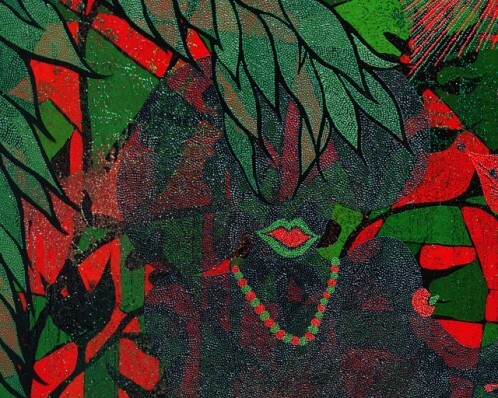 The New Museum currently presents the first major solo museum exhibition in the United States of artist Chris Ofili. Occupying the museum’s three main galleries, Chris Ofili: Night and Day spans the artist’s influential career, encompassing his paintings, drawings, and sculptures. Over the past two decades, Ofili’s practice has become identified with vibrant and meticulously executed artworks that meld figuration, abstraction, and decoration. The artist’s diverse oeuvre has taken imagery and inspiration from such disparate, history-spanning sources as the Bible, hip-hop music, Zimbabwean cave paintings, Blaxploitation films, and the works of William Blake. As the title of the exhibition suggests, Ofili’s practice has undergone constant changes, moving from boldly expressive to deeply introspective across an experimental and prodigious body of work. The exhibition features over thirty of Ofili’s major paintings, a vast quantity of drawings, and a selection of sculptures from over the course of his career. Ofili’s early paintings from the ’90s were created using his signature layering of materials, including paint, resin, glitter, and elephant dung, a material he first collected during an art study trip to Zimbabwe in 1992. The exhibition brings together twelve of his canvases from this period, which combine spectacularly rendered psychedelic surfaces with provocative imagery from a staggering array of cultural sources and assemble a cast of characters including religious figures, political and cultural icons from across history, and imaginary heroes. From this early period, Ofili established an approach to painting that is both seductive and rigorously historical. After moving to Trinidad from London in 2005, Ofili’s work took a new direction with the The Blue Rider series, which takes its name from the early twentieth-century artist group that sought spirituality by connecting visual art with music. Since then, Ofili has gone on to create a number of large blue paintings. For this exhibition, nine of these works are brought together for the first time in an architectural environment designed by the artist. Composed in dark hues of blue, this series of paintings evokes the blue light of twilight and the soulfulness of blues music. Although rooted in the landscape and culture of Trinidad, Ofili’s blue paintings extend beyond to offer a contemplative approach to history, identity, and ways of seeing. His most recent canvases have been animated by exotic characters, outlandish landscapes, and folkloric myths that resonate with references to the paintings of Henri Matisse and Paul Gauguin. This exhibition also includes a selection of paintings from Ofili’s Metamorphoses series. These brightly colored canvases were inspired by the poem of the same name by Ovid and illustrate the ancient Roman author’s stories of gods and humans, including the tale of the goddess Diana and the hunter Actaeon. These paintings were initially created at the invitation of the National Gallery, London, in response to their own series of paintings of Diana and Actaeon by Titian from the mid-sixteenth century. Ofili’s paintings offer a unique interpretation of both the original text and its painted interpretations, opening up the ancient myths to new, contemporary readings. These works are displayed in a dreamlike, painted environment inspired by British filmmakers Michael Powell and Emeric Pressburger’s 1947 film Black Narcissus. Ofili’s hybrid juxtapositions of high and low, and of the sacred and the profane, simultaneously celebrate and call into question the power of images and their ability to address fundamental questions of representation. Through a series of unexpected connections between his most important bodies of work, Ofili’s exhibition at the New Museum reflects the vast breadth of his practice.